2 MATH RESOURCES in 1 PACKAGE! 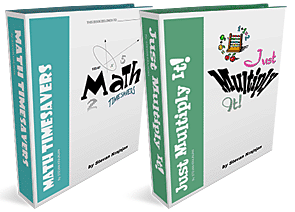 MATH TIMESAVERS – Math Timesavers is a 90 page, quality collection of difficult-to-find, often-used forms, masters and reproducible sheets for your math program - Math Timesavers has them all (K-8). They are visually attractive, professionally designed, ready for immediate download and use. Math Timesavers will help improve personal efficiency, organization, quality of lessons and appearance of your class handouts, forms and worksheets. Don’t re-invent the wheel by creating your own… use Math Timesavers! JUST MULTIPLY IT! – Inability to recall multiplication facts hinders student progress in many areas of the mathematics curriculum. Students risk losing interest in math when frustration becomes overwhelming. Just Multiply It! systematically identifies, records and remedies areas of the multiplication table that have not yet been committed to memory. Teach your students the multiplication facts in a fun, quick, organized, and visually appealing way! Fractions Chart - very practical visual aid and handout the helps students understand fractions. This is a popular download. Just Multiply It Assessment Form - (2 pages) identifies areas of the multiplication table that students have not yet committed to memory. Instructions are simple and assessment can be performed by either a teacher or another student - answer sheet is included.